They say when you know you know and after a brief consultation over the phone with Meg I knew she was my kind of person. Her best friend is one of my friends, Lauren Grove of my favorite wedding blog, Every Last Detail. Lauren has a gift of connecting people and she knew what she was doing when she sent recommended Meg to contact me. 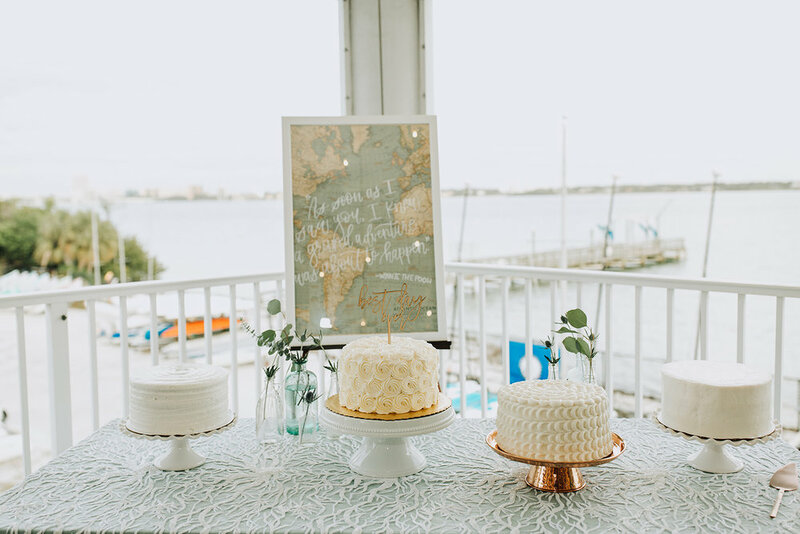 Then I met Ralph and the fun began as we all worked together to create their travel, adventure, Disney, coastal-inspired wedding. I quickly picked up on the fact that they just loved to get out and enjoy life and don't take things too seriously, it was an infectious vibe and everyone needs more of that in their life. Being able to showcase that in their wedding was a real treat. Meg and Ralph love to travel, love the outdoors, the beach especially. They love going to Disney together, in fact that is where Ralph asked Meg to marry him (squeal!). Yes, some of the elements were a challenge to bring together and incorporate but I love a good challenge. We brought in their love for Disney in a lot of the signage, using quotes and through their favors. To incorporate their love of travel we used suitcases and globes as decor. 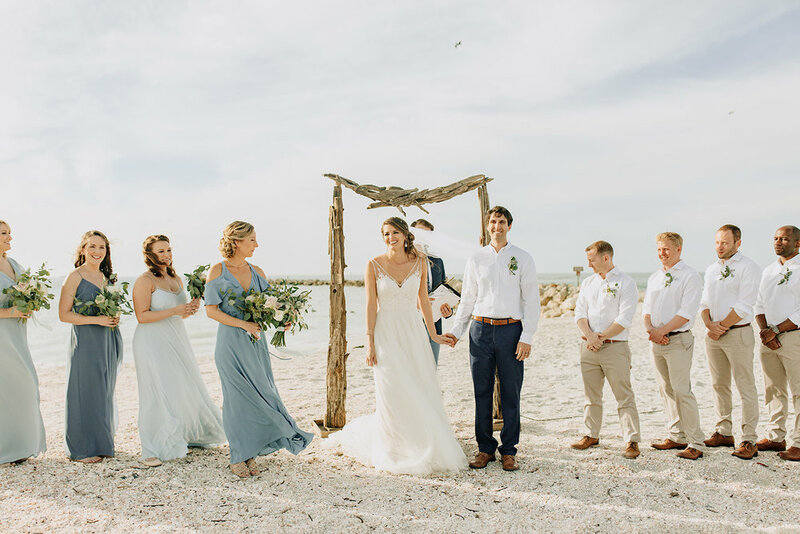 Inspired by the water, the color palette was serene with soft monochromatic shades of blue and natural driftwood elements. It was so calming and care-free but still intentional and stylish. 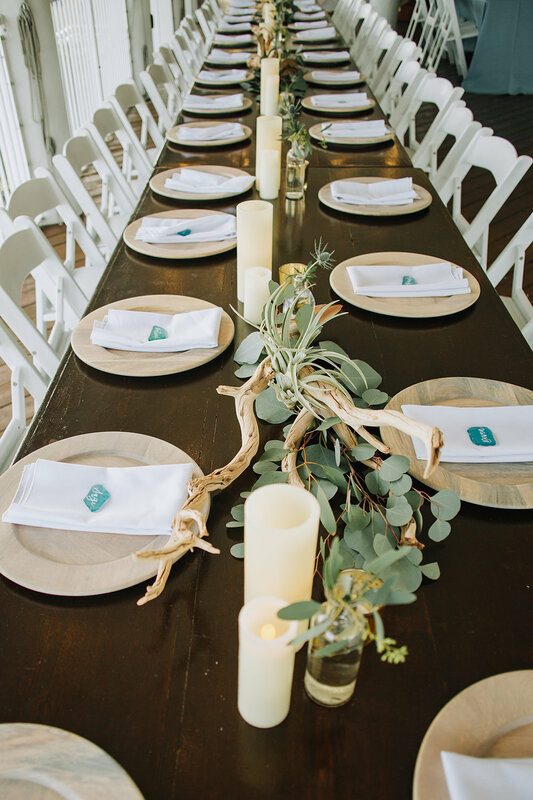 Meg and Ralph wanted a venue that could help them incorporate the outdoors and wasn't too stuffy. 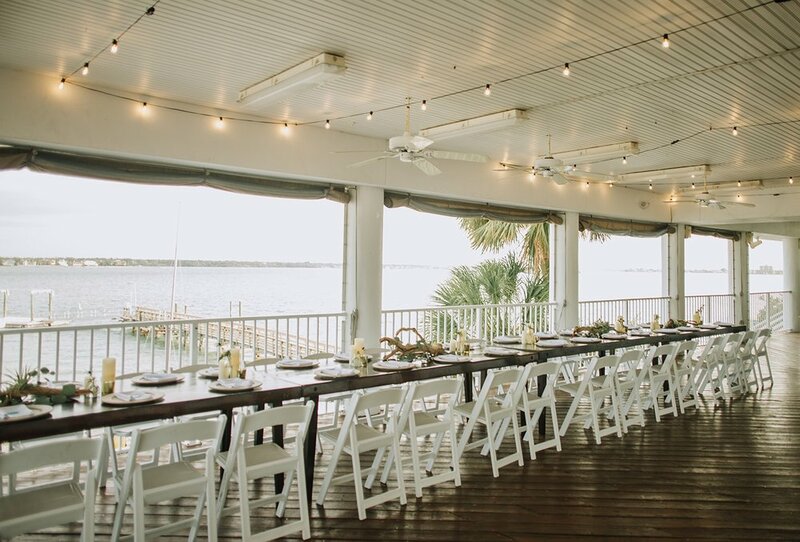 I planned a day filled with venue visits and they were hooked right away at stop one, Clearwater Community Sailing Center. With this view, I was on board with their enthusiasm. We loved that it was outdoors but covered and in February the weather was absolutely perfect here. When guests arrived to cocktail hour they were greeted by two tables, a sign in table and a name card table. 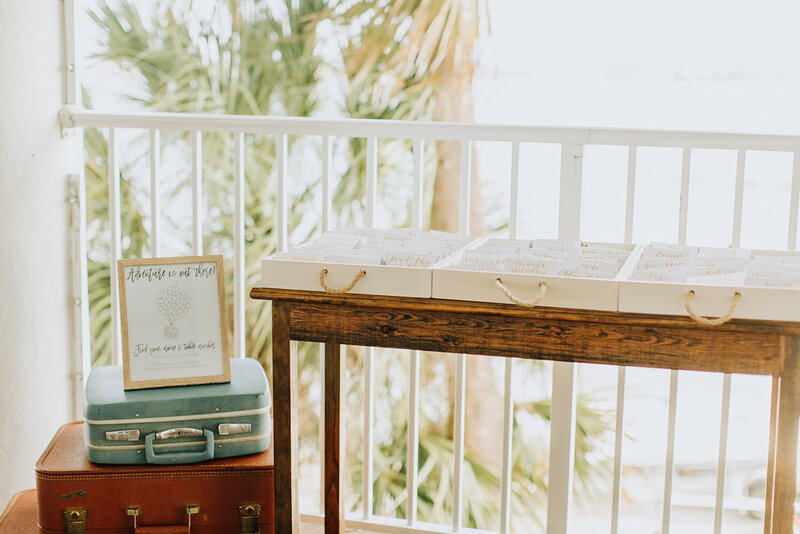 Guests signed a globe in lieu of a guestbook to tie in their love for travel and provide a keepsake to display in their home. 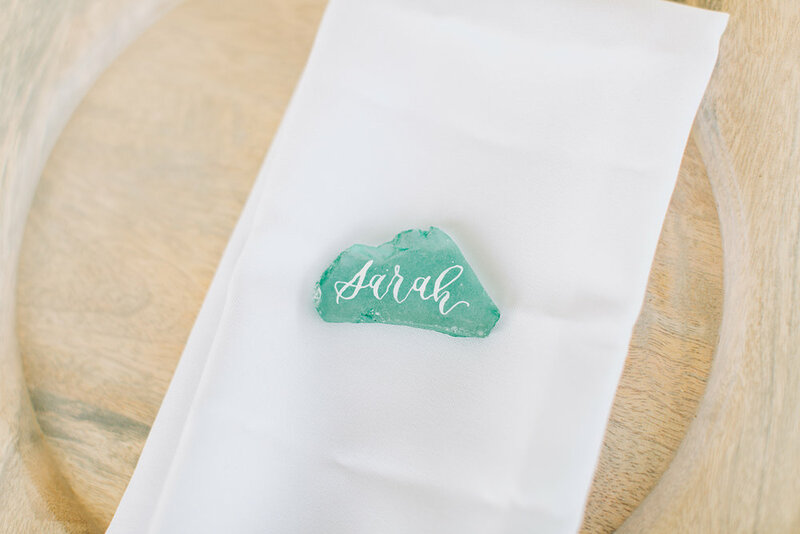 The name cards calligraphed in gold were displayed in pieces of sea glass. 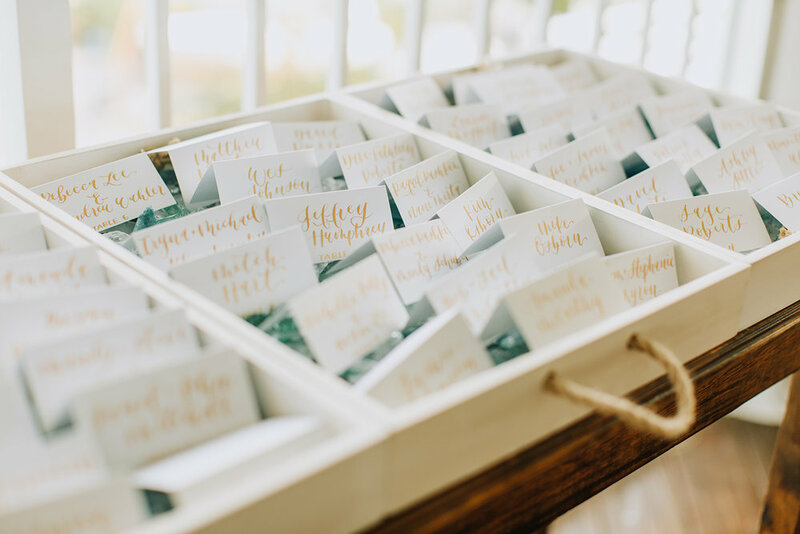 Each table name was a place that Meg and Ralph had visited together and loved. At the end of the night Mickey Mouse shaped rice crispie treats were served as a favors. Meg and Ralph, I wish you many more adventures together. Working with you was an absolute dream and honor.